NICE, France Five people have been arrested over the Nice truck massacre, French prosecutors said Saturday amid grief and anger that authorities failed to thwart yet another mass attack in this already-grieving nation. At least 84 people were killed and 200 injured when a truck driver used his vehicle as a weapon and cut a trail of terror through Bastille Day revelers after a fireworks display. French President Francois Hollande called Thursday night's attack "undeniably terrorist in nature." However, prosecutors said the driver, Mohamed Laouaij Bouhlel, wasn't known to intelligence services. Bouhel, a 31-year-old Tunisian living in Nice, was known to police for "threats, violence and petty theft," according to prosecutor Francois Molins. He was convicted in March and given a six-month suspended sentence for a road-rage incident involving a wooden pallet but was never on a watch list. For reasons still unclear, Bouhel climbed into a 19-ton white refrigerated truck and maneuvered it onto the packed Promenade des Anglais, hit the gas and sent bodies flying on a 1.2-mile rampage before he was shot dead by police. French interior minister Bernard Cazeneuve said Saturday that, based on early investigations, Bouhel "appears to have become radicalized very quickly." He told reporters after a government security meeting in Paris: "Individuals who are sensitive to [ISIS'] message commit extremely violent actions, without necessarily having taken part in fighting, without necessarily having been trained." Flowers and tributes were left at barricades on the seafront Saturday as France observed three days of national mourning, but the truck was earlier removed by forensics teams. Clusters of police remained on the seafront, watching over the scene and the crowds. Memorials to the victims grew by the minute. At one, a table was set up for people to write messages of solidarity. "Our thoughts with Nice. Love from Liverpool, Baghdad and Syria," one man wrote on his sheet of white paper. Not far down the promenade, friends Annie Trevelly and Valerie Mygardon stood at the barrier looking out at the sea next to two bouquets of flowers. "What a tragedy," said Trevelly, 57. "Poor France, poor us." "Poor France," Mygardon, 47, agreed. The two friends live two blocks from where the truck was brought to a stop. Normally, they would have gone out for the fireworks but Mygardon had a headache. Trevelly told NBC News that, from the apartment, she could hear people screaming "run, run." "It's unthinkable unbelievable. It's just beyond belief," she said. "That someone could do this drive this ... It's beyond belief." As she spoke, her sadness turned to anger that police and security services had failed her city. "There are specialists they should have known," she gasped. "After what happened in Paris ... They should have done more to stop this!" Mygardon, who appeared to be in shock, agreed. "They killed our children here children," she said. "It pains us this is a huge wound." "People shouldn't have to become accustomed to attacks"
Their views were echoed by many in Nice on Saturday. While the city was slowly starting to return to normal, with tourists back on the streets and beaches due to open, questions echoed. How could the truck have gotten past security, how the driver was able to continue for so far before he was stopped? How did officials not prevent it? The country was already reeling from Charlie Hebdo attacks in January 2015 and the Nov. 13 siege on Paris that left 130 dead. The terror spree in neighboring Belgium and a known threat to the recent Euro 2016 soccer tournament had authorities on high alert. In the hours after the attack, Hollande extended the state of emergency he implemented in November and called up thousands of reservists moves that many in Nice said was not enough. The president's convoy was reportedly booed as it drove through Nice, reflecting frustration and anger over his perceived failure to address the threat of terrorism. Opposition politician and former prime minister Alain Juppe told RTL radio that not enough had been changed in wake of the Paris attacks. "If all measures had been taken, the tragedy ... would not have happened," said Juppe, according to the AFP news agency. Rodolphe Auvergne, 18, could not agree more. Riding his bike down the Nice promenade just after 2 a.m. local time, he stopped to read a note pinned to the barricades with flowers. 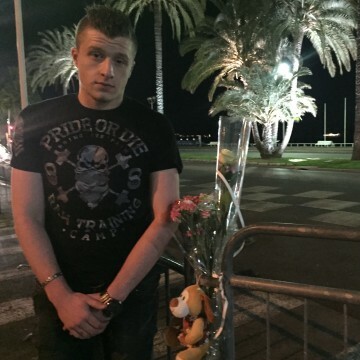 The teen lives in Paris but is vacationing in Nice and saw panicked crowds fleeing the carnage. "It was hard especially after the Bataclan," he said, referring to the nightclub in Paris where dozens were killed in November. "I think France is turning to a bad direction." He called for more security measures, accusing French officials of paying only lip service to the problem. "It didn't stop. It's not doing anything," he said. "The government isn't doing enough." Auvergne told NBC News that he has been scared to ride the metro since the Paris attacks. "Charlie Hebdo, Bataclan, now Nice. Where will the next attack be? We are not secure ... we live in fear," he said passionately. "I don't think it's right for people to live like this ... People shouldn't have to become accustomed to attacks. They need to make changes, and fast." MADRID - It took the White House more than seven years to lock in Spain on President Barack Obama's foreign travel schedule. But events beyond Mr. Obama's control have turned his first and only visit to Spain, the largest European country that had yet to welcome the president, into a rushed one. Instead of spending two days sightseeing in southern Spain and tending to more official business in the capital of Madrid, the White House scrapped some of Mr. Obama's events - including a staple of his foreign travels, a question-and-answer forum with young adults - and crammed the rest of his schedule into Sunday. He had been scheduled to travel to Seville for cultural events, but that was among the plans canceled. In a statement announcing the change of plans, the White House said the president had accepted an invitation from Dallas Mayor Mike Rawlings to visit. "Later in the week, at the White House, the President will continue to work to bring people together to support our police officers and communities, and find common ground by discussing policy ideas for addressing the persistent racial disparities in our criminal justice system," the statement read. Deadly shootings last week of black men by police in Louisiana and Minnesota, followed by the sniper killings of five police officers in Dallas, the president to make the unusual choice to return to the White House late Sunday, a day earlier than originally planned. Mr. Obama has been loath to tear up his schedule in response to previous acts of violence, saying repeatedly that altering his plans would be tantamount to giving in to terrorists. But terrorists didn't strike in Baton Rouge, Louisiana, near St. Paul, Minnesota, or Dallas. The assaults followed June's deadly shooting at an Orlando, Florida, nightclub and the rise in so-called lone-wolf terrorism, heightening fears about public safety. The White House said Sunday that President Barack Obama will travel to Dallas on Tuesday and deliver remarks at an interfaith memorial service. The service will take place at the Morton H. Meyerson Symphony Center. The White House says Obama is making the trip at the invitation of Dallas Mayor Mike Rawlings. The president noted the "difficult week" as he made small talk Sunday with King Felipe VI after arriving at Spain's Royal Palace for a meeting. The king thanked Mr. Obama for visiting under the circumstances. The stop in Spain was the last leg of what is likely the president's final trip to Europe before he leaves office in January. He arrived late Saturday from Poland, where he attended a NATO summit. The visit highlighted security cooperation between the trans-Atlantic allies, as well as political and economic ties. Mr. Obama met with acting Prime Minister Mariano Rajoy before heading to Naval Station Rota, in the south. He toured the USS Ross, one of four guided-missile destroyers based there, and addressed troops there before the flight home. He told members of the U.S. military in Spain that America will overcome various threats and challenges not only through its military strength but by staying true to its values, including respect for one another and the refusal to be divided by ethnicity and religion. Mr. Obama said in the face of humanitarian crises, the U.S. and its NATO allies will deliver health and hope to those in need. In the face of aggression, they will stand for the sovereignty of nations such as Ukraine. Obama said that despite the threats America faces, he's confident that people of goodwill will ultimately overcome forces that seek to "divide and destroy us." Spain has been gripped by a political stalemate for months, with Rajoy unable to garner the necessary support to form a new coalition government following a late-June election. It was the country's second round of inconclusive balloting in the past year. Rajoy's party also won an election in December, but no other major party was willing to help him form a government. Mr. Obama addressed the political situation in an interview Saturday with the El Pais newspaper, saying he hopes Spain's next government will be just as committed to strong relations with the U.S. and Europe. The president has recently stressed the White House's belief in a stronger European Union in the wake of the Brexit vote in the United Kingdom. In Spain, Mr. Obama said the world needs Spain's contributions to the campaign against the Islamic State of Iraq and Syria (ISIS,) to counterterrorism efforts that prevent attacks and to its fellow NATO members. "The relationship between Spaniards and Americans goes back centuries," he said. "We're connected by the ties of family and culture, including millions of Americans who celebrate their Hispanic heritage. Spain is a strong NATO ally, we're grateful for Spain's many decades of hosting U.S. forces, and we're major trading partners." "That's why the United States is deeply committed to maintaining our relationship with a strong, unified Spain," the president said. Mr. Obama said he has longed to return to Spain ever since he passed through while backpacking across Europe decades ago, during his 20s, a point he underscored just before his private meeting with the king. He said he could not have imagined that he'd return years later and be greeted by royalty. "I wish I was staying longer," Mr. Obama said Sunday.